Day 3 started with good walking weather – in my book, that means cloudy but warm with sunny spells – and we were excited by the prospect of actually seeing some proper Roman wallage at some point in the day. We were also prepared for a bit of elevation and thought it would make a welcome change from the flat (and boring) bits. We could see the landscape starting to ripple in front of us from the beginning. When we came to Walton – Wall town, surely? 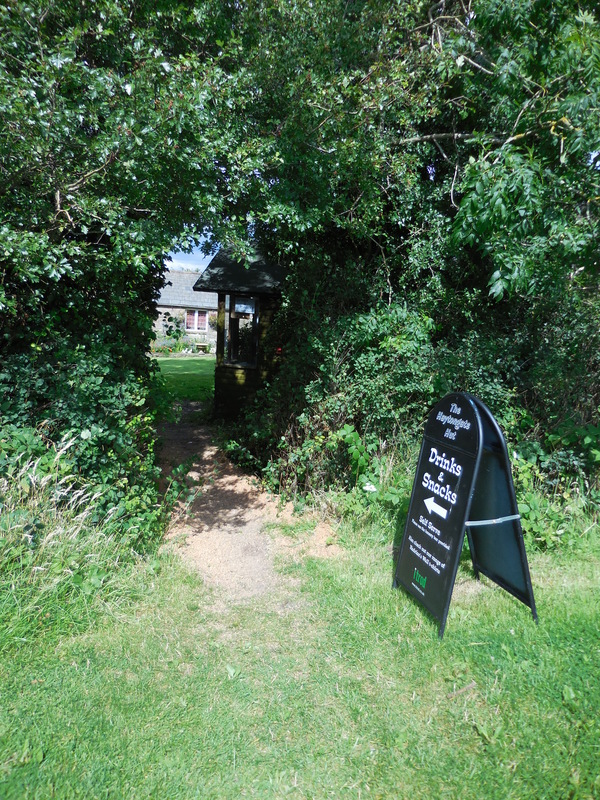 – there was a sign for a tea room in the village while the path seemed to carry on straight past. 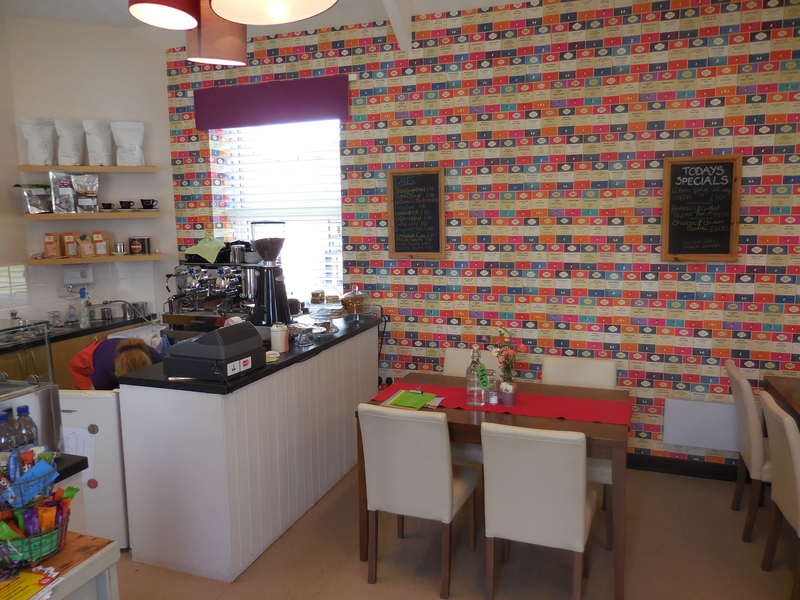 We thought a coffee might be in order and went looking for The Reading Room, which turned out to have Penguin paperback cover wallpaper on the inside! While we had our refreshments, another walker came and sat down. He was a young guy with a huge and heavy-looking pack. Turns out he was carrying a tent, sleeping mat, sleeping bag, stove and everything he needed. He was going to walk it in 5 days and had just realised that he would have to rush past some of the things he wanted to see, so he was a bit glum. We were silently very happy we had decided on a slow walk and set aside 8 days. The young man, who came to be known as Map Man whenever we spoke of him afterwards, had a map in a plastic pouch around his neck. He looked a bit confused about the map, so I asked him if we could help, as we had two guidebooks, one East bound and one supposedly going in either direction. The East bound one we never used so I offered him it, and he took it gratefully. I hope he found it useful or that he passed it on to someone else. This seemed to fit in with the theme of the day, as it turned out. 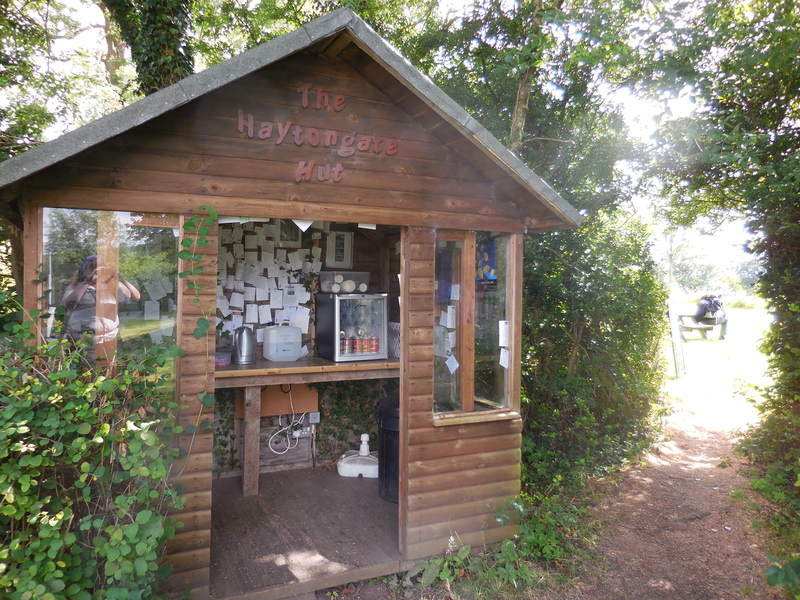 At first there was a gap in a hedge by some picnic benches, with a sign pointing to the Haytongate Hut where you could help yourself to refrigerated refreshments, boil the kettle for a brew or take refuge from the rain, all for a donation in an honesty box. The walls in there were filled with lots of notes from grateful walkers. Opposite it was another hut with T-shirts, mugs etc for sale or order. I never got the ‘I came, I saw, I blistered’ mug and regretted it all the way! Later we saw this honesty set-up. 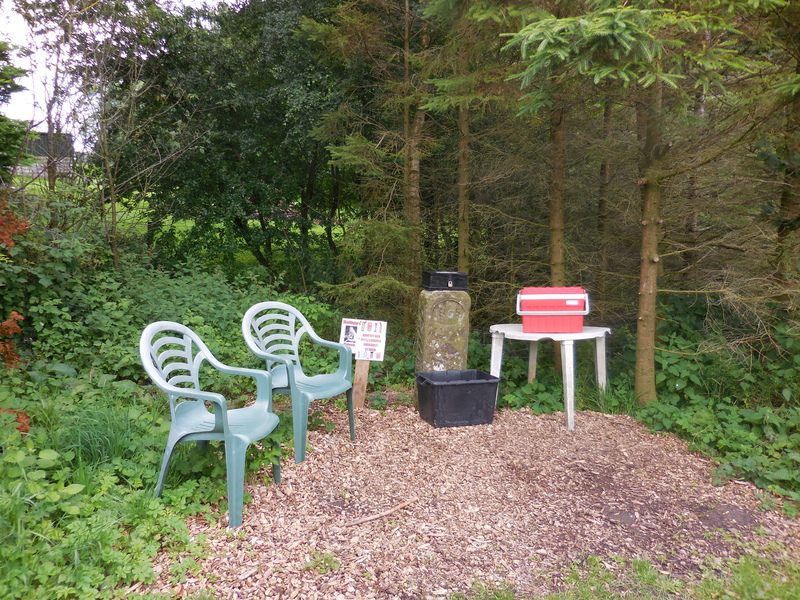 The sign reads Matthew’s Honesty Box, with refreshments at £1 and plastic chairs for weary travellers. A great idea! Then it started to go uphill. 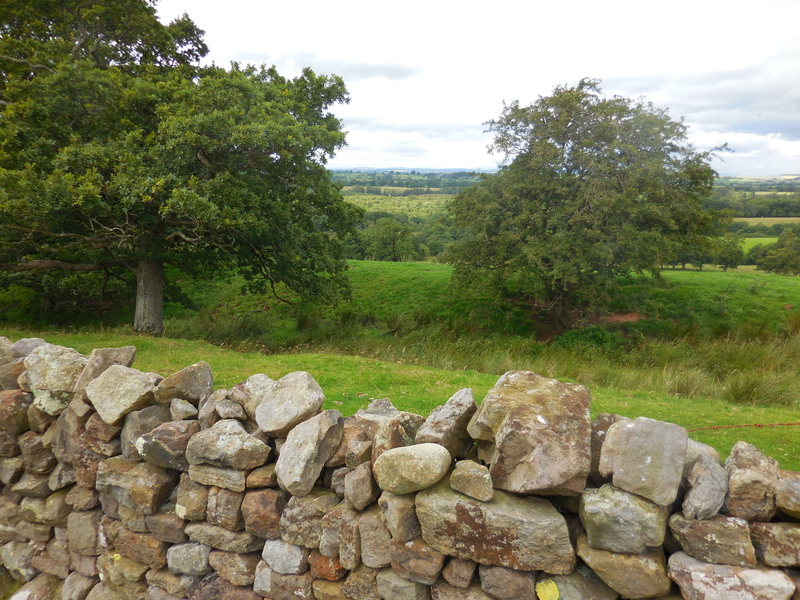 And along the uphill fields were stone borders, which we kept a keen and Wall walkery eye on. However, they were just walls, stone walls, and although most of the stones probably came from the Wall, they were not in fact The Wall. But then, suddenly … there it was!! 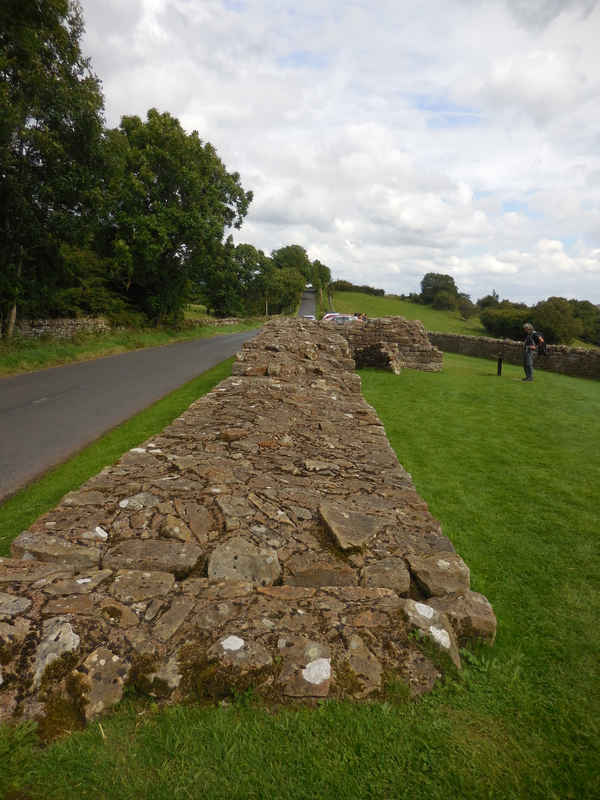 A bit of Hadrian’s wall!! OK, so that bit might have been a tiny bit reconstructed, at least partially, but then came this!! Now we really were in Hadrian’s Wall territory, and the number of cars and tourists snapping photos were a bit unexpected. We followed this proper Wall excitedly until my PF flared up with the tarmac, and then it started raining. 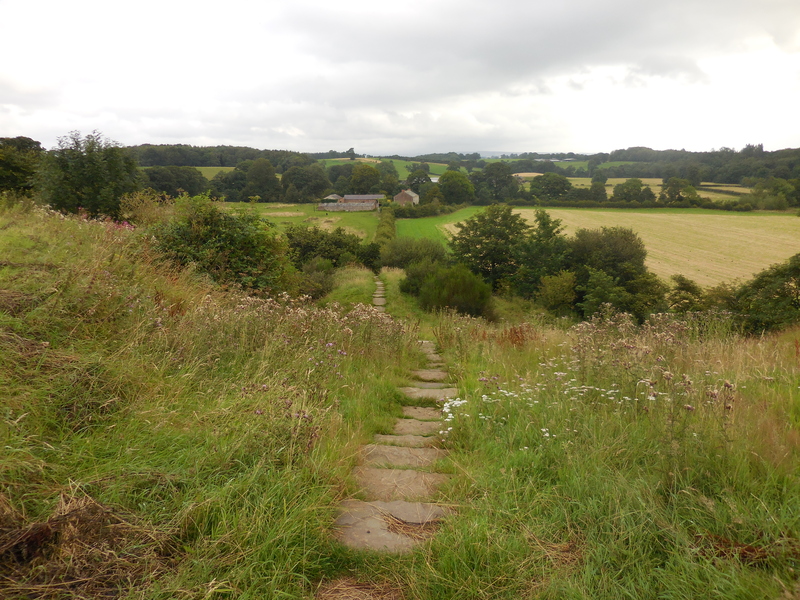 We just managed to get to Birdoswald fort museum and tearooms before the heavens opened, and then found out we were very close to Gilsland, where I had booked a room. We thought we’d brave the rain – it was still warm – and then left. We thought we would follow the Wall in a straight line there, and were very confused when the path took a sudden turn in the opposite direction and went sharply downhill! 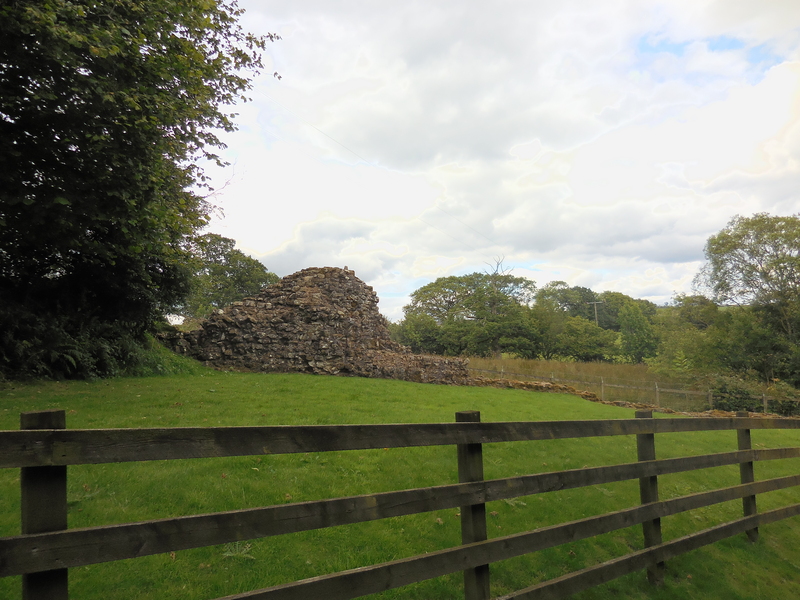 Turns out we were following the outline of the Birdoswald fort, along the river, which has since changed its course, and saw the abuttment of the old bridge – now safely on dry land. 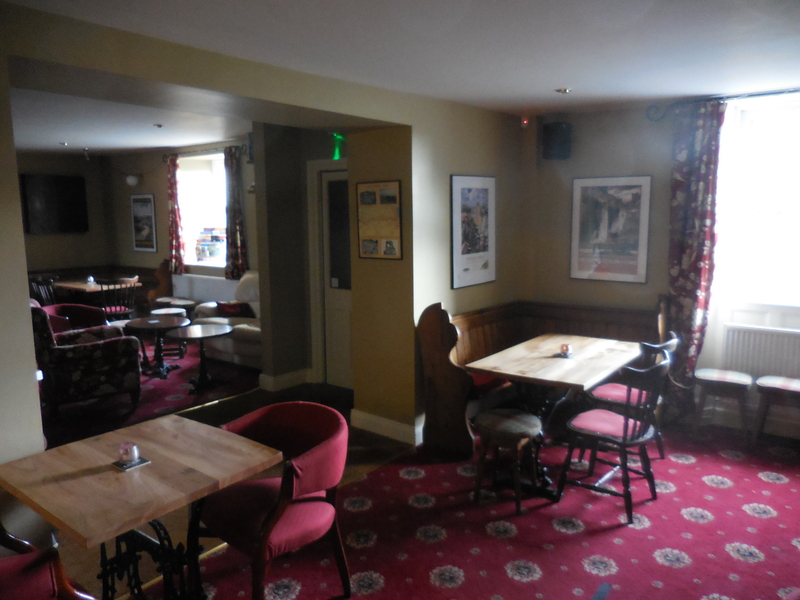 Then we soldiered on in the rain until we came to the Samson Inn and found a warm welcome, a cold pint and a fantastic shower before we went downstairs again for a lovely meal at the corner table in the cozy restaurant/pub. Highly recommended! The breakfast was lovely too, with a choice of smoked salmon and poached eggs instead of the usual fry-up. And the Path carried on just outside. “wallage” is a good word!